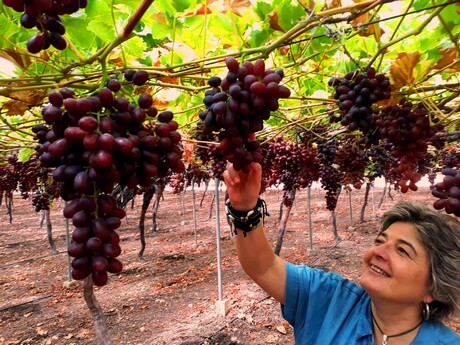 Home/News & Blog/Spain: "Best quality seedless grapes in 15 years"
The leading producer of seedless table grapes, the Murcia-based company Moyca, affirms that, to date, the grape campaign has been excellent. After a difficult start under pressure from the late Egyptian fruit, they say that the best is yet to come. This was explained by Enrique Moya, CEO of the company, and by commercial director Josefina Mena. "The good weather of the last four months has contributed significantly to our exceptional campaign in terms of both quality and production." Ms Fina Mena points out that "it will be an exceptional campaign as far as quality, size and colour are concerned, especially when it comes to colour and sugar content. We will continue until the end of November, as scheduled with our clients." The quality of grapes is defined mainly by three variables: colour, Brix degrees and calibre. "These three parameters are perfectly defined for each of the 45 varieties that Moyca currently markets," says Fina Mena. "The Sable, Midnight Beauty, Cotton Candy, Sweet Sapphire, Muscat, Ivory, Sweet Globe, Timco or the incredible Adora Seedless, Autum Crisp and Pristine have a quality above any specification." "We may be in for the best red grape year ever seen. The colour of the Timco, Sweet Celebration, Krissy, Crimson, Allison, Jack's Salute and Scarlotta is reaching perfect levels," affirms Fina Mena. According to Enrique Moya, this is not only due to the good weather conditions. "Moyca and its technical team, led by Ms Trini Díaz, technical and development director, has a very differentiated production strategy to obtain the best results in terms of colour. Thus, the various MOYCA farms are located in the most suitable areas and climates to meet the varietal needs." Trini explains that "we have invested a lot of effort and money to have a production under the slogan, 'the best fruit for each week'." Trini points out that "the irrigation control, protection and production systems are giving us extra help to achieve absolute efficiency." "Thanks to good planning and an extensive varietal range," they assure that the supply of red grapes is guaranteed to its customers. They are currently working on the red varieties Crimson, Sweet Celebration and Krissy, after which the Allison and Timco will follow. The campaign will eventually come to a close with the Scarlotta. Worthy of note is that the high temperatures of recent weeks have led to an earlier start of the Crimson harvest for some producers outside Moyca, for whom the campaign has started about ten days earlier than in a normal year. "This situation could entail supply problems in late August and the first half of September," they point out. According to Fina Mena, the black varieties are currently represented by the Melody and Sweet Sapphire, and the campaign will come to a close with the Autumn Royal. As for white grapes, there is Autumn Crisp and Sweet Globe and the campaign will finish in late September with the Pristine.